The Celebrity Apprentice returns on Sunday, March 3, with all all-stars addition. The cast list has fans buzzing as some of the past seasons most impressive and most controversial contestants are back. 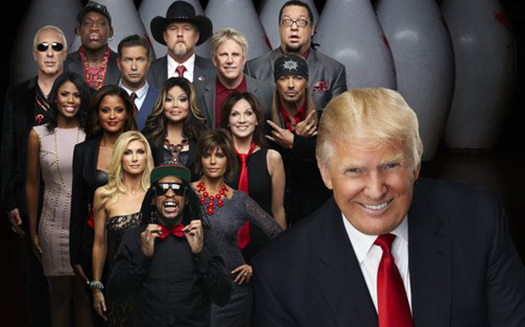 The full list is Trace Adkins, Stephen Baldwin, Gary Busey, Penn Jillette, Lil Jon, Bret Michaels, Dennis Rodman, Dee Snider, Marilu Henner, La Toya Jackson, Claudia Jordan, Omarosa, Lisa Rinna and Brande Roderick. In addition some past players are returning as judges — Arsenio Hall, Joan Rivers, Piers Morgan and John Rich. In a recent conference call interview Donald Trump talked about putting together the all-star cast and what to expect this season. "It was very easy to get everybody to come back. We got everybody that we wanted back. And it’s actually very easy to cast the show because everybody really wants to be on it. Whether it’s Piers Morgan or Joan Rivers or Trace Adkins or Bret [Michaels], so many have done so well for themselves and their brand. They have made a lot of money and they have also made a lot of money on the show itself for charity but their brand has made a lot of money. So I wasn’t surprised to see him come back at all, no." "This was the group we wanted. Everybody that we asked to be on the show we were able to get. You look at what has gone on with Trace and with Gary Busey and some of the people we have talked about and it’s just amazing. You have a list of the people on the show. And it has just been a chemistry thing. We wanted the right chemistry. You never know if it’s going to work but we picked people and the chemistry really did work." "They became a lot smarter, they understand the system better. We have a couple that did very, very well that frankly I wasn’t expecting as much from and they have learned the system a little bit. So it wasn’t that I was expecting more, I think they have become much smarter. And I actually think that it made for an exciting show, very exciting show. Almost every one of them really have learned so much and it has become very, very exciting. It’s really a strong show, amazing show." "Bret already won it. And to be honest I was a little surprised that Bret [came back] because the others are sitting next to me as my advisors, the other winners. And Bret really wanted to go on the show and really make a lot of money for his charity and that took a lot of courage. As somebody that won the show, I was surprised. I don’t think I would have done it. But as somebody that had won the show and then to go back for a second took a lot of courage. And he did that because of you raise a lot of money for your charity. And it’s going to end up being very good for him, too. We’ll see how that all turns out." "Yes she will be a judge. And Don and Ivanka and Eric are judges. But what we’ll do is put Piers [Morgan] on in a little bit. The conflict between Omarosa and Piers, which is just a continuation of what happened previously on the show, the conflict is as good, as smart, as tough, as mean as anything that we’ve ever had on the show. But Piers is a judge with me and he sits by my side replacing Ivanka a couple of times and likewise with Joan. And we have some amazing evenings. It’s really amazing. So in other words I have taken some of the past winners and made them judges to replace my children for a couple of shows." "He was fabulous. He was just great on the show. Gary is very interesting because he’s somewhat different. He has been solidified. He’s a piece of work. In his own way he’s a genius. He really is, he’s amazing…. There’s no acting, it’s just the way he is. He is a very unique guy. He is a strange kind of a guy but he’s a very unique guy. He’s very smart. It takes you a while to realize that and then he even borders on brilliance probably. But he’s great entertainment and great show business and people really wanted him to come back." "What surprises me more than anything else is the fact that these are name people, these are people that are successful and in some cases very, very successful like Bret and like La Toya [Jackson]. But they’re very successful people. And it is a tough go. They devote so much effort, so much time, so much energy and I’m just amazed. There aren’t very many people that could do it and I give a lot of credit to the people that go on the show. And certainly it’s good for them but it’s also good for charities because we have raised literally probably over $10 million to charity on the various shows. And it’s great, I love it, I love it. We actually had a couple of nights where we raised $1 million in one night. So it has been a great thing for charities." Watch All-Star Celebrity Apprentice beginning March 3, on Sunday nights at 9 p.m. EST/8 p.m. Central on NBC.